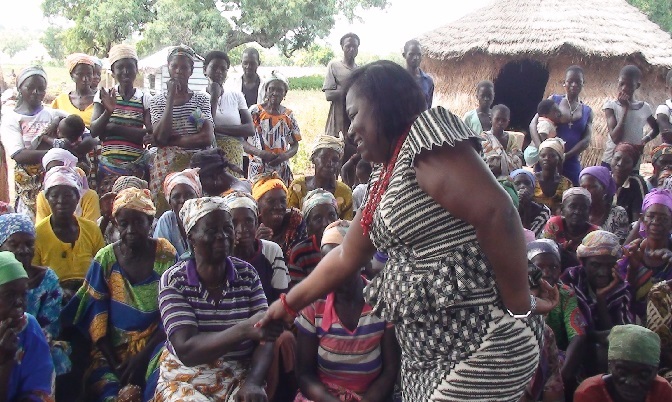 Madam Oye Lithur exchanging pleasantries with some of the women. 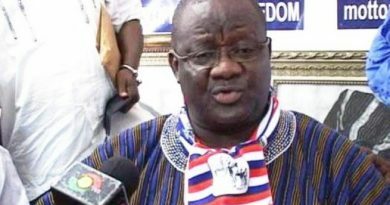 A total number of 302 alleged witches and wizards are currently camped at the Gnani witches and wizards home in Gnani in the Yendi Municipality of the Northern Region. 187 are women with 115 males. 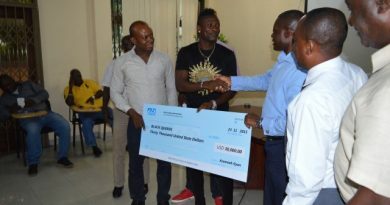 This was made known to the Minister of Gender, Children and Social Protection, Nana Oye Lithur, when she visited the inmates on a familiarization tour. Some of the women who have stayed there for so many years could not remember the number of years they spent in the camp because of illiteracy. They could only refer to some chiefs who reigned at the time they were camped for allegedly “killing people, inflicting poverty and sicknesses on community members. An 85 years old woman, Napaga Fati, told TV3 that she was once married to the late overlord of Nanumba traditional area, Na Dasana the fist in the late 60s but after the death of the king she was accused of witchcraft and exiled to the camp. She however denied being a witch. Nana Oye Lithur announced to them that government will register them onto the National Health Insurance Scheme to enable them access free medical care at hospitals and other health centres. She also announced that the inmates will be reregistered to benefit from the LEAP 1000 project adding that from September this year, every member household will now receive 32 Ghana Cedis, three member household will receive Ghc 44, whiles a four member household will receive Ghc 45 to mitigate their income levels. The Minister also announced that all leprosarium in the country will also benefit from the LEAP programme and their members registered on the NHIS. Those to be registered onto the NHIS will also include prison inmates. She announced that Government is to enroll 6,006 households in the Northern and Upper East Regions targeting the vulnerable poor pregnant women and children under two years old. Nana Oye Lithur said the inclusion of children is to prevent them from stunting through malnutrition and appealed to their parents to ensure that the children are immunized at the appropriate time. She said currently in the Northern Region, 12,206 households are benefiting from LEAP and a total of 9,184 new people would be added. 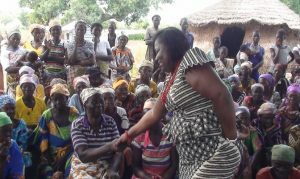 The Programmes Manager for Action Aid Ghana, Mrs. Alia Mumuni, said her outfit has been providing the alleged witches and wizards with food, medical supplies and in some cases provided roofing for their thatched houses. She said through their advocacy programmes, some district assemblies have factored the needs of the alleged witches and wizards in their medium development plans to make life comfortable for them. Mrs. Mumuni said the major problem facing the inmates is the lack of access to water, pointing out that the nearest source of water during the dry season is the river which is about three and a half kilometers away from their location. It was observed by TV3 that the women lie down on mats and no single person has a mattress in her room. The Minister later presented assorted food items, soft drinks and bathroom slippers to them.